Teacher Feedback – Feedback delivers high impact on students at relatively low cost. 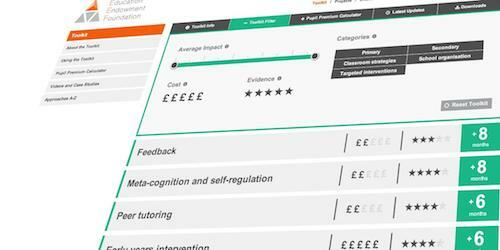 According to the Sutton Trust, feedback is seen to deliver high impact on students at relatively low cost. Feedback refocuses either the teacher’s or the learner’s actions to achieve a goal, by aligning effort and activity with an outcome. The Sutton Trust – Education Endowment Foundation Teaching and Learning Toolkit – is an accessible summary of educational research that provides guidance for teachers and schools on how to use their resources to improve the attainment of disadvantaged pupils. The Toolkit currently covers 34 topics, each summarised in terms of their average impact on attainment, the strength of the evidence supporting them and their cost. You can download the Toolkit here. Despite the powerful effects on learning that feedback provides, studies indicate that it is challenging to make it work in the classroom – and this is where we think that Teacher Feedback can help. In busy classrooms, Teacher Feedback can multiply the teachers’ effectiveness. For example a whole class can begin a creative writing lesson by listening to their own bespoke feedback, recorded by their teacher before the lesson. Students can listen to their feedback several times if they need to, in or out of school. Teacher Feedback also presents a channel to parents and families who support the learner. What’s more, Teacher Feedback comes packed with some great ‘student-centred’ tools to support assessment for learning. Students can leave peer feedback for one another if desired. Teachers can approve or reject the peer feedback before it is sent, and give a reason explaining why. In addition to leaving 1:1 feedback for individual students or peer feedback, teachers can also select groups of children to receive the same feedback, as well as broadcasting feedback to an entire class if they wish to. This is very useful when preparing differentiated feedback or instructions for groups within your class, and again, saves valuable time. Last but not least, teachers and senior leaders in school benefit from a suite of useful monitoring tools. They can track which students have listened to their feedback in full, partially or not at all and how many times they’ve listened to it. They can also see graphs of exactly how many minutes or hours of feedback has been recorded over time. Sign up now to Teacherfeedback here.